The following, among others not yet used, were given to me by teachers, among them being H.P. Blavatsky. Some were written, others communicated in other ways. To me they were declared to be from manuscripts not now accessible to the general public. Each one was submitted for my judgment and reason; and just as they, aside from any authority, approved themselves to my reason after serious consideration of them, so I hope they will gain the approval of those my fellow workers to whom I now publish them. (20) As body and mind and soul have each a power of independent action, any one of these may exhaust, independently of the others, some Karmic causes more remote from or nearer to the time of their inception than those operating through other channels. (22) Karma may be of three sorts: (a) Presently operative in this life through the appropriate instruments; (b) that which is being made or stored up to be exhausted in the future; (c) Karma held over from past life or lives and not operating yet because inhibited by inappropriateness of the instrument in use by the Ego, or by the force of Karma now operating. (28) No man but a sage or true seer can judge another’s Karma. Hence while each receives his deserts, appearances may deceive, and birth into poverty or heavy trial may not be punishment for bad Karma, for Egos continually incarnate into poor surroundings where they experience difficulties and trials which are for the discipline of the Ego and result in strength, fortitude, and sympathy. (29) Race-Karma influences each unit in the race through the law of Distribution. National Karma operates on the members of the nation by the same law more concentrated. Family Karma governs only with a nation where families have been kept pure and distinct; for in any nation where there is a mixture of family – as obtains in each Kali-Yuga period – family Karma is in general distributed over a nation. But even at such period some families remain coherent for long periods, and then the members feel the sway of family Karma. The word “family” may include several smaller families. (31) Egos who have no Karmic connection with a portion of the globe where a cataclysm is coming on are kept without the latter’s operation in two ways: (a) by repulsion acting on their inner nature and (b) by being called and warned by those who watch the progress of the world. SOME RELATED ARTICLES: A Right Understanding of Karma, Who was William Quan Judge?, The Welcome Influence of William Q. 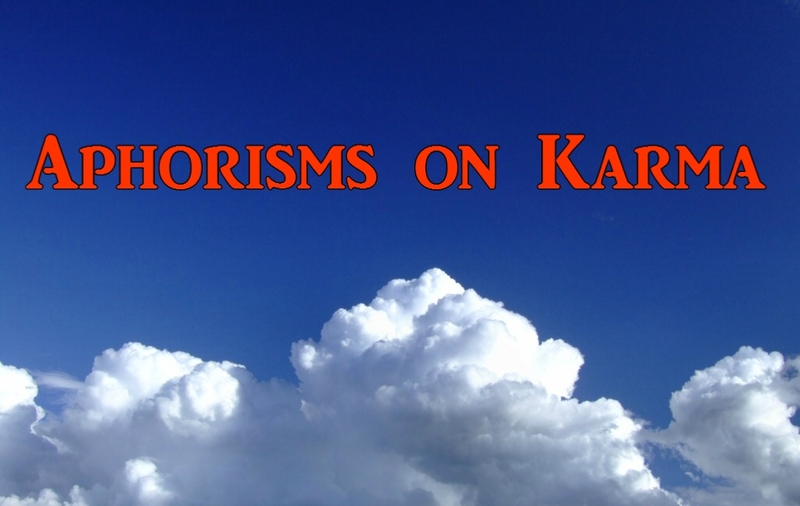 Judge, A Right Understanding of Reincarnation, Questions about Karma, Is Karma Merciful and Compassionate?, Blavatsky on Karma, The “Karmic Visions” of H.P. Blavatsky, Helpful Hints for Spiritual Progress, and There is No Injustice.